La Vencedora setting the fastest time in the Governor's Stakes trials at Indiana Grand. SHELBYVILLE, IN�OCTOBER 21, 2017�Remington Park Oklahoma-Bred Futurity(RG2) winner La Vencedora finished second to stablemate BS Special in a slight upset Saturday in the $134,400 Governor's Stakes at Indiana Grand. Starting from post nine in the 10-horse final all eyes were on La Vencedora, the fastest qualifier and the most celebrated horse of the field. A daughter of IVORY JAMEShad a mild misstep out of the gate right to the inside of BS Special, giving the other filly an edge in the 350-yard dash. It was clear halfway through the race that the top two were the ones to beat. Side by side, BS Special and La Vencedora began their battle, and neither filly was giving in an inch. Jockey James Flores had ridden both fillies to victory in the trials and it was no surprise he chose La Vencedora in the final. He was aware that BS Special would give it her all en route to the finish line and it would take a big effort to get by her. Although La Vencedora closed in during the final few strides, BS Special was able to maintain control of the race, winning by just the margin of a head. All American Ease maintained positioning on the inside to finish a comfortable third in the race that stopped the timer in :17.740 seconds. La Vencedora is out of the Mr Jess Perry mare Jess Shakem. 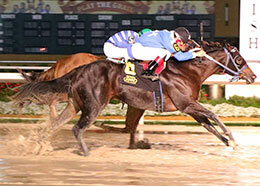 John and Brant Barley own the Oklahoma-bred filly who picked up $26,880 to increase her earnings total to $415,086. Larry Sharp is the trainer and Bobby D. Cox is the breeder. Third-place finisher All American Ease was also bred by Bobby Cox.